QHow can I maintain data? A	Each application-form consists of four tab-sheets: "Search Area", "Data Entry", "Table View" and "Data Export". When opening a form, the tab-sheet "Search Area" is the active one. For data maintain please switch to "Data Entry"- tab-sheet. 3. Search in "Contracts creation, maintain and display"
QWhen searching in the form-"Contracts creation, maintain and display" I do not see any data. However, there are data under "Data entry". A	There is a problem with the layouts file VERTRAEGEDBGridSuche and VERTRAEGEDBGridTab. In these files the layout of the data grids will be saved. If you remove them, then you will see the data again. You will find those files in Windows under 2. ConManDiTu.log from the Temp-Folder: C:\Documents and Settings\YourUsername\ Lokale Einstellungen\Temp (Win XP) or C:\Users\YourUsername\AppData\Local\Temp (>=Win 7). QAfter downloading the online help from our web-page and copying it into the application folder, the CHM-file can be opened, but no chapters and content can be displayed. 2. In the "General"-screen there is following text: "The file originates from another computer. The access has been blocked for security reasons.". 3. Click the button "Allow". 4. Click the button "Apply" and then the "OK"-button. QWhy does this error message appear at the attempt to start the program: "The Database ...is not running or it is not reachable! If the database resides on a remote machine, then please make sure if the TCP port-3050 on the remote machine is enabled. You will find the description for setting the firewall in the Application-Help (ContractManagerDiTuHelpEN/DE.pdf), under "Installation, Deinstallation -> Firewall Setting". The Program will exit now." The Firebird-database is not running. It means, the Windows-service "Firebird Guardian - DefaultInstance" has not been started yet. 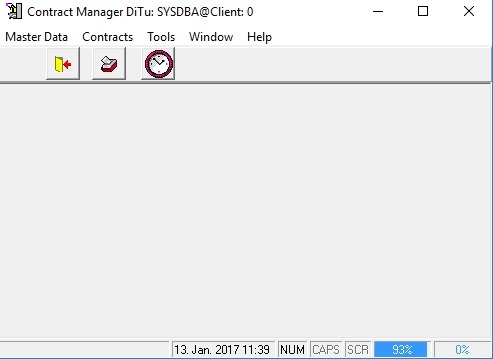 The SYSDBA-password is not the default one from the installation. This has been corrected in the version 5.0.0.8. After the installation of the "Contract Manager DiTu" - application it has to be started for the first time from the administrator - environment. In that case necessary registry entries will be created. Please check the privileges on the installation directory (default C:\Program Files\Tumbov Software\Contract Manager DiTu). The user must have read-write privileges on the directory. You have installed the Contract Manager DiTu with the option – "Application" and no Firebird – Software has been installed. Because of that, the Contract Manager DiTu cannot establish the connection with the database. Please install Contract Manager DiTu with one of the following options: "Server and Client", "Server" or "Client". 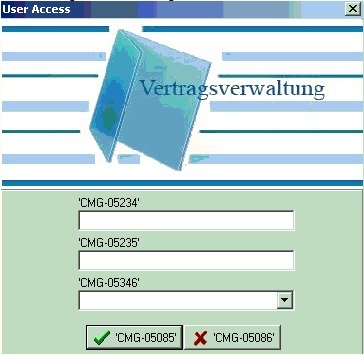 You can find detailed help in the Online Help, chapter 1.1 Installation of the "Contract Manager DiTu"
Missing domain in the INI-file ConManDiTu.ini, in the entry "DatabaseHostName"
If the start of the application works only under an Administrator-account, and not under a normal domain-account, then please set the security settings on the installation folder of "Authenticated Users". Furthermore, the same must be done on the application folder (1). If it still does not work, then please do the same of the following two files in the installation folder: ConManDiTu.ini, FBCLIENT.DLL. (1) Under Windows 7 or higher: "C:\ProgramData\Tumbov Software" and under Windows XP: "C:\Documents and Setting\YourUsername\Application Data\Tumbov Software"
2. ConManDiTu.log from the Temp-Folder: 2. ConManDiTu.log from the Temp-Folder: C:\Documents and Settings\YourUsername\ Lokale Einstellungen\Temp (Win XP) or C:\Users\YourUsername\AppData\Local\Temp (>=Win 7). You can locate this folder when you navigate to Start -> Run, then enter %TEMP% and then press ENTER. QWhy do I get following error messages at start of the program:Why do I get following error messages at start of the program: The directory you have entered is read-only i.e. you don’t have write privileges in that directory! The file VRTRGVERW.DB does not exist! Therefore no data could be displayed/created/modified. The correct path for VRTRGVERW.DB must be entered in the Registry Entry: Path. A The problem persists, if the application is running on a Windows 7/8-System (or newer), in the default folder - "C:\Program Files…". 2. Please copy the files VRTGVERW.DB, QUERIES.DB in another folder, e.g. C:\Contract Manager DiTu. However, we are suggesting to reinstall the application into another folder. A The login data (username and/or password) are incorrect. If you try to login with the TEST-user, then please use the password "test" in lowercase (without quotes). QWhy do I get the following error message at program start: "Login access check failed! Error code -902: Unsuccessful execution caused by a system error that precludes successful execution of subsequent statements"
A The login access data (username and/or password) is/are incorrect. Please correct your access data and try again. Otherwise you can login with the SYSDBA-access. QWhy do I get the error message at program start "gfix.exe can not be found"
A	The gfix.exe - file is missing on the client-PC in the given folder. Please download the gfix.exe from www.tumbov-software.de/update/gfix.exe and then copy it into the given folder. A	The language file vrtrgverw.db is missing in the installation folder of the Contract Manager DiTu. This file will be installed when you use the setup type "Application", "Client" or "Server and Client". 1. The language file VRTRGVERW.DB is missing in the directory where you installed the "Contract Manager DiTu" - application. This file will be installed when you use the setup type "Application", "Client" or "Server and Client". 2. The security settings must be adapted to the directory-C:\ProgramData\Tumbov Software\Contract Manager DiTu (only relevant in case of standard-installation). If you cannot fix the problem by that, please copy the files VRTGVERW.DB, QUERIES.DB into another directory, e.g. into. "C:\Contract Manager DiTu\Language_Files" and then adjust the registry entry "Path" under [HKEY_CURRENT_USER\Software\Contract Manager DiTu], so that it is set to the new directory. QWhy do I get the error message at program-start: "The entry DatabaseFilePath could not be found in the file ConManDiTu.INI!" A	The problem persists, if the application is running on a Windows 7/8-System (or newer), in the default folder - "C:\Program Files…". Either grant write-privileges on the application-directory or install the application in a new directory. A	This error message appears, when you try to upload a file into a contract, without saving the contract before. Please save the contract first, and then upload the file. This error message does not appear anymore, beginning from the program-version 5.0.0.0. Error message "Can not save into ... (Path)"
QIf the application has been installed into a network folder, there is an error message when closing the application-forms: "Cannot save into ... (Path)". If the user is logged on as an Administrator, then there is no error message. A	The Windows-User has to possess write-authorization on %APPDATA%. The Windows Shell-folder %APPDATA% means C:\Users\YourUsername\AppData\Roaming. QWhy does this error message appear when starting the program : "Invalid Token"
A	After entering the access data on the login-screen, the overview of the birthdays appears. After closing the birthday-screen, the error message "Invalid Token" appears. Afterwards, the program starts but without readable menu descriptions. There are only CMG-codes. The reason for this is, the failed prcoedure for sending the mails. The workaround for this malfunction is to deactivate the option for sending the mails at program start. You can do this in the program options. Since the menu entries do not have readable descriptions, you can find the program options under the third menu entry from left, and then the first sub-menu. The check-box "E-Mail Send by Program-Start" must be deactivated. Furthermore, the sending of the mails can be set-up on the server. More info how to do this in the Online-Help under the chapter 9.2. QWhy do I get the error message "Error by transfering the components" during the installation? A	You do not possess write-authorizations for the selected directory. Either ask for a write-authorizations, or install the application using an Administrator-account (see chapter 1, "Installation of the Contract Manager DiTu" in the program online help). Error message "Installshield Engine (iKernel.exe) could not be installed"
QWhy do I get the error message "The Installshield Engine (iKernel.exe) could not be installed. The folder C:\Program Files\Shared Files\InstallShield could not be created. Please make sure you possess the necessary authorization for this folder (0x5). A	You do not possess write-authorizations for C:\Program Files\Shared Files. Necessary action: Either ask for a write-authorizations, or install the application using an Administrator-account (see chapter 1, "Installation of the Contract Manager DiTu" in the program online help).